Some men bring home flowers for their wives. Others bring chocolates. And these things are lovely and thoughtful, but let's face it - I can buy my own flowers and chocolate. I feel fortunate that, since my husband specializes in comics and toys, the little gifts he brings home for me are far more interesting, and in the case of the latest, even downright historical. We were making dinner when he suddenly remembered he had something for me. 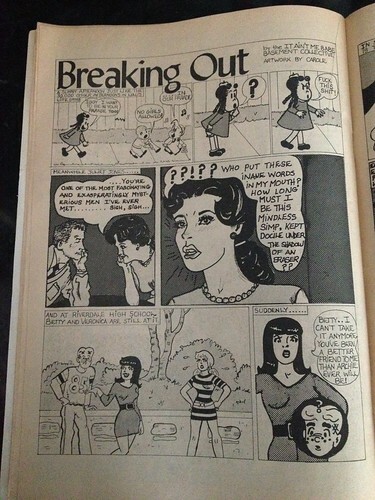 It might look like your standard underground comic of the '60s and '70s, but this little magazine was a revolution of sorts - the first comic that was totally produced by women. 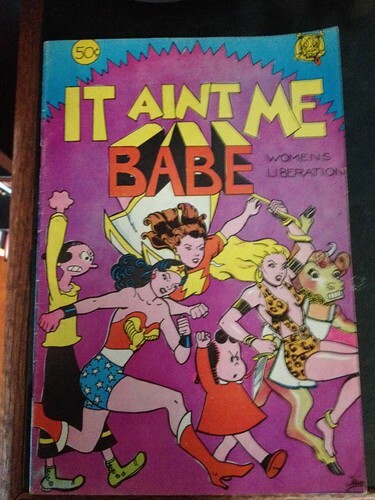 Though It Ain't Me, Babe, was a one-shot, many of the women represented in it eventually banded together again to start Wimmen's Comix, an all-female anthology published from 1971-1992. The anthology was an important springboard for the careers of many female artists, who had found it difficult to break into the boys club of underground comics. It also served as the inspiration for several like-minded anthologies, ensuring that even more women were getting their art out into the world and their voices heard. So all of that high-minded history aside, how are the stories and art in It Ain't Me, Babe? In many ways, it depends on the lens we look at them through. Personally, I've never been particularly drawn to underground comics. There are the greats, of course, like Art Spiegelman's Maus or Charles Burns' Black Hole, but for the most part the crude content of the earlier examples (both in art and subject matter) leaves me a bit cold. That said, the stories in this book are surprisingly readable and relevant for a modern audience. I'll share a few of my highlights - if you want to know more, you'll have to dig up a copy of the book for yourself! Trina Robbins, the driving force behind this book, offers two tales - "Lavender" and "I Remember Telluria." Both are set in fantasy realms, which set them apart from the rest of the book's offerings - most of the other stories are set in the "real world," even when the protagonists are funny animals. Robbins does some of my favorite art in the book, with gorgeous use of black and white and simple but oddly beautiful people. The stories act as bookends to one another, the first being a tale of masculine betrayal, the second one of what a woman gives up to be with the man she loves. My favorite story in the whole book is "Breaking Out," attributed to the entire collective, but with artwork by Carole. (No last name, how mysterious!) 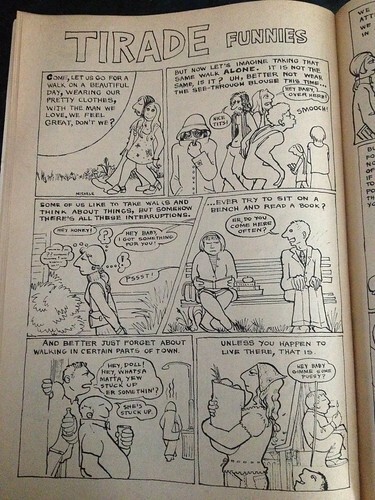 In it, female characters from various traditional comics - Little Lulu, Betty and Veronica, and Petunia Pig among them - get fed up with the patriarchy and leave their comics, literally walking out of the roles set for them to build a ladies-only commune. The art is masterful, wonderfully imitating the source material. Granted, not much happens other than the ladies getting fed up and finding joy in just hanging out with each other, but it works. Michele Brand offers two stories, "Monday" and "Tirade Funnies". The first is a mildly amusing tale of a day-dreaming secretary who imagines herself as queen of the jungle, freeing her co-workers from an evil slave trader who looks suspiciously like her boss. The second story, however, was the one that hit home the most for me in the whole book. Brand's style remains the same - soft, round bodies on her people, and a humorous tone throughout. Yet the content - basically the idea that a woman can't walk alone without being cat-called, hit on, and harassed - struck me hard. Here's a book that was written 44 years ago, and even though we've come so far in many ways, here's a problem that women still face every single day. One that I have personally experienced just in the past month, and countless times before. More than any other, this story made me glad this group of women got together and made this book happen, because apparently, we still need that kind of solidarity.